Image size: 32 1/2" x 16 3/16"
It's 0030 on D-Day, 6 June 1944. 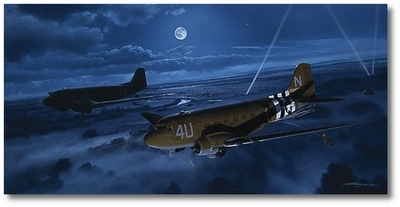 By the light of a full moon, C-47s from the 89th troop carrier squadron, 438th troop carrier group, pass swiftly over the Normandy countryside. These aircraft are among a total of 850 C-47s taking over 15,000 troops to enact the initial assault in the D-Day invasion. General Dwight E. Eisenhower declared the Douglas C-47 one of the few pieces of equipment "vital to our success in Africa and Europe." 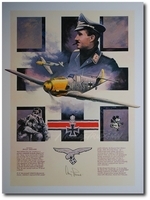 The aircraft itself, however, would have meant nothing without the fearless airborne forces, who at the signal "Green light, Jump!" parachuted into battle.